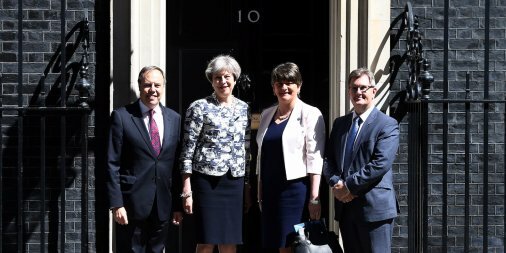 DUP leader Arlene Foster (centre, right) has every reason to smile – she screwed £1.5 billion out of Theresa May (centre, left) and Mrs May is STILL having to seek support from elsewhere. Theresa May handed over £1.5 billion to the DUP for no reason. That is the message from 10 Downing Street today, as the Conservative minority government prepares to offer other parties a chance to help make policy. Clearly, it is further confirmation of the existence of the “magic money tree” – despite Tory denials. Not only do they have access to an infinite amount of cash, they can also afford to waste it. That will be cold comfort to the family of Jodie Whiting, who took her own life after the Tory-run Department for Work and Pensions stopped her Employment and Support Allowance. Apparently the Tories don’t have money for the sick and disabled, and will find any excuse to stop paying their benefits (in this case, it was missing an appointment). It will also be hard for our public servants to accept – like the police who are being driven to suicide by the effects of Tory cuts. Mrs May doesn’t have money for a properly-funded, fully-staffed police force, and doesn’t care how badly her cuts hinder their ability to do their job. But she will happily waste £1.5 billion on a deal with the DUP – and then negate that deal by asking every other party in Parliament to help shore up her weak and wobbly government. Her language is deliberately contradictory. In her heavily-trailed speech tomorrow, she is expected to say she is “convinced that the path that I set out in that first speech outside No 10 and upon which we have set ourselves as a government remains the right one”. That could be applied to the whole of the UK – but, in that case, there’s no point in having a Conservative government at all. If Mrs May doesn’t have any ideas, and can’t govern without help from the Opposition, then for crying out loud, let’s have another election and bring in a Labour government that can! In the meantime, it seems we will be subjected to the pitiful spectacle of May’s right-hand-worm, Damian Green, burrowing through the TV and radio studios, making a fool of himself and his party. It’s nonsense. Opposition politicians contribute to government all the time in the normal Parliamentary process. It is up to the government to either adopt those contributions or reject them. It seems to This Writer that Mrs May is trying to dodge that process. Why? Perhaps because she fears her own party will (metaphorically) knife her in the back. She thinks her own Conservatives are plotting to replace her (and she’s probably right) so she is trying to find a way to obviate their influence. But doesn’t that expose her as a nakedly power-hungry, would-be tinpot despot, willing to betray everybody just to hold on to a vestige of power and authority? She has no mandate from the public. She has no right to negotiate Brexit – her vanity election was called on that basis and the public rejected it. She is losing the support of her own power base. She must go. If she won’t resign, how can we remove her? Having spent the last two years hurling sneering and extremely nasty insults at Jeremy Corbyn, the corrupt Theresa May now pleads for his help. I think I know what my answer to her would be. We seem to be entering the territory of ‘set them up’. Asking for labour support is not in the Tory philosophy, if any ‘support’ is given, it opens the door of the ‘it wasn’t us’ it was the fault of those other politicians. Let the Tories rot in their own cess pit. When you have so many back stabbers and pleb haters behind your back then a handful of DUP opportunists is going to be a drop in the ocean. Trying to avoid the inevitable she is just emulating King Canute……call the election and be done with you. May wants to involve a cross party group in getting us the best possible outcome, one would have thought that instead of wanting a party that has agreed to brexit to oppose everything and interfere with the process people would applaud it.